(APN) CONYERS — After years of the State of Georgia operating with an unverifiable and fundamentally flawed E-voting system, a pilot program to test a new E-voting system with a voter-verifiable paper trail, is going smoothly and to rave reviews by voters in Rockdale County. Secretary of State Brian Kemp’s Office invited Rockdale County to participate in the pilot, as Kemp’s office is considering recommendations for implementing a new statewide system. The pilot is taking place in two precincts in Olde Towne in Rockdale County, and within the City limits of Conyers, for the General and Special Election on today, November 07, 2017. The pilot lasted for all of early voting and continues today, Election Day. Computer scientists have advocated for this type of system in Georgia since 2002, when then-Secretary of State Cathy Cox and the Georgia Legislature first installed the Direct Recording Electronic (DRE) machines, which are without a paper trail to independently verify the voters’ intents. The two new machines being tested in Rockdale County are the Express Vote Ballot Marking Machine and the DS 200 Scanner and Tabulator. 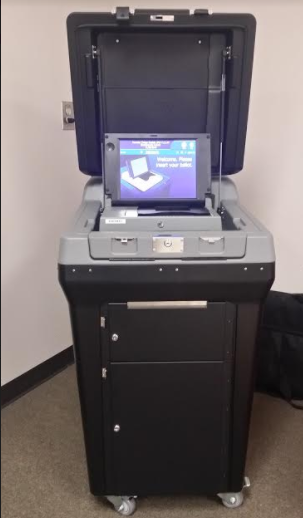 The two machines work together: The Express Vote records your vote on a paper ballot; and the DS 200 makes an image of the ballot and saves the ballot. “I like the system. It was very easy and fast,” Lisa Hall, a Rockdale County voter, told Atlanta Progressive News after she voted on the new system. “It has a back up paper ballot in case they have a contested election. The old system did not have a back up and it was questionable to start with. It’s good to see the system working better than it did before,” Steve, a business owner in Conyers, told APN. The company, Election Systems and Software (ES&S), makes the Express Vote and DS 200. “There has been no to little learning curve for the users on these touch screens,” Carol Dubal, Early Voting Manager, told APN. “Having a paper ballot, and a change to look at it, and not having the option to accidentally cast a ballot at the same machine is really helping the users,” Dubal said. The new system works like this: first, the voter gives their voter identification, name, and birthdate to a poll worker, who prints out their completed registration form, which they verify and sign. Next, a poll worker give the voter a blank ballot with their county, state, precinct, a ballot number, and a barcode, but no personal information is on the ballot. The voter inserts the ballot into the Express Vote Ballot Marking machine, selects their candidates on the touch screen, reviews the selections on the summary screen, confirms their choices, and removes the printed paper ballot. “The Express Vote Ballot Marker only marks how you vote on to the ballot, it does not store anything. The feedback we have received is that it is much easier to use than the DRE,” Cynthia Welch, Rockdale County Board of Elections Supervisor, told APN. Next, the voter puts their printed ballot into the DS 200 precinct scanner and tabulator. The DS 200 scans the ballot and makes an image of the ballot. Then the physical ballot will drop into a twice locked box where it will remain stored. At the end of the voting period, the poll workers close and lock the ballot box and transport it to the election office. The encrypted flash drive from the DS 200 goes into a stand-alone computer that is not connected to the Internet, and counts the votes at the election office. “The biggest plus with this system is a voter verifiable paper ballot,” Welch said. “This new pilot system combines a lot of the processes, for example, the DS 200 counts your absentee by-mail ballots, and it counts your in-person ballots. With our current system, you have separate optical scanners that count your absentee by-mail, and the DRE counts the in-person votes. The DS 200 combines the two processes and also stores the paper ballots,” Welch said. Secretary Kemp has been under increasing pressure to upgrade the out-of-date DRE voting system and provide a verifiable paper ballot, especially since the server breach at Kennesaw State University’s Center for Elections System and the Russian hacking fears after the 2016 U.S. Presidential election. In March 2017, Kemp received a letter from twenty computer experts that urged him to immediately move to verifiable elections with paper ballots. There is currently a lawsuit challenging the E-voting machines under federal and state law, and challenging the results of this year’s Special Election in Georgia’s Sixth U.S. Congressional District. It was recently reported that KSU’s Center for Elections Systems improperly wiped a server clean. KSU is no longer involved in Georgia elections. After all the voting drama this year, the pilot study at Conyers with new equipment and a paper ballot is a breath of transparency that can put confidence back into the voting system. Welch stressed the need for Georgia to use a united system. “You should be able to go into any county, and our procedures and systems are the same,” she said. Kemp’s office said it was too soon to speculate about the final cost or which equipment would be procured. In general, the price is expected to be at least 100 million dollars, and it is hoped that a new system be in place by 2020. The price and timeline are currently uncertain and depend on what the General Assembly decides. The General Assembly will have to put forth a bill and appropriate the funds for any new statewide voting system. Before I’d read this article, if someone had told me I would ever assert that $100 Million dollars is a bargain for anything, I would have thought that person was insane. However, $100 Million dollars to protect our democracy and restore confidence in elections – State of Georgia, do it YESTERDAY! Today at the latest! I absolutely agree – we cannot put a price tag on democracy! Secretary of State Kemp’s pilot in Rockdale County uses ES&S ExpressVote, a ballot marking device (BMD). ExpressVote is designed to meet HAVA/ADA Voluntary Voting System Standards (VVSS) for those with special needs, such as voters who are blind, to independently mark paper ballots. Using BMDs for all voters is not a voting system advocated by election integrity or computing security/technology experts. No state in the US has or would purchase an all BMD voting system. It would not only be poor decisionmaking in terms of provisioning an elections’ system but would be fiscally irresponsible. Here’s why. Able voters can hand mark paper ballots. Disabled voters can use BMDs. Both able and disabled voters feed their paper ballots into the same precinct based ballot scanner for casting their ballots, tabulation and locked storage. At the highest estimate, replacing GAs paperless DRE voting system with the system being used in the Rockdale pilot, according to Chris Harvey, Elections Director, when he testified at the House Science and Technology meeting in September 2017, would require the purchase of ~1 BMD for every 1 DRE. With approximately 26,500 DREs in GA, if we use the outside estimate of $5000 each (cost before bids/bargaining), just the hardware, not software, maintenance, storage, etc., = $132,500,000. Add to that the cost for a precinct based ballot scanner @$5,000 x1 per precinct x 2,700 precincts (again the state can get these for less then the $5,000 like other states have done, for example: Maryland, Michigan) = $13,500,000. So the outside figure for the hardware alone for SOS Kemp’s piloted system for BMDs for able and disabled voters and precinct ballot scanners to cast the paper = $146,000,000. Compare that to the cost of the gold standard for new voting systems according to experts: a voter-marked, precinct based ballot scanning voting system with audits. Able voters hand-mark their ballots and the disabled use BMDs. The state would need 1 BMD + 1 precinct based ballot scanner per precinct = $27,000,000 for hardware. Kemp’s piloted system for the whole state would be, just for the hardware, over 5x more expensive and not even deliver the best voting system for many practical and technical reasons. Suffice to say, able voters would be disenfranchised because it takes longer to vote on a BMD than to hand mark a ballot; it would be harder for Georgia’s aging population of poll workers to set up, support and take down the all-BMD system; and more. Everyone should request a Paper Ballot to vote by mail VBM. No hassle at the polls, no polling place switching, no challenges. Just do your research, fill in at leisure and mail it back. The expense of the new system for more touch-screen shenanigans is a waste of money. Get real Paper Ballots.